A new website has been launched by Ermysted’s Grammar School’s Old Boys’ Society, with the aim of bringing together former pupils of the school. This site features memories and stories of life at the school through the years, as well as an obituaries list and details of famous former pupils. At launch, there are articles written by the poet and author, Blake Morrison, as well as Ig Nobel prize in Physics winner Dr Patrick B Warren. Other famous Old Boys profiled include ‘Slumdog Millionaire’ screenplay writer Simon Beaufoy (1980-83), footballer Rick Holden (1976-83), former Chancellor of the Exchequer Iain Macleod (1922) and BBC political correspondent Chris Mason (1991-98). Former pupils of Ermysted’s are being encouraged to contribute to the site with articles, memories or photographs from their time at the school. They’ll also be able to use the site to find out about upcoming events and pay their annual subs. The website has been built by Embsay-based marketing consultant Charlotte Fox. As well as the website, the society has embraced social media with a Facebook page and a Twitter feed. The website went live just in time for the 2013 Old Boys’ Dinner, held in the Refectory at the school on Gargrave Road, Skipton, in December. Around a hundred former pupils and masters of the school attended, with guest speaker Brian Dugdill (1956-63) talking about his work for the United Nations’ Food and Agriculture Organization, where he has been leading the Smallholder Dairy Development Programme in countries such as Bangladesh, Burma and Thailand. The evening raised around £1200 through a quiz and donations, which will go towards the development costs for a new sixth form facility for the school. 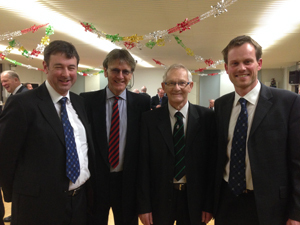 Picture from the Old Boys’ Annual Dinner 2013 shows (L-R) Ermysted’s headmaster Graham Hamilton, guest speaker Brian Dugdill, Old Boys’ Society Chairman Ken Oxley and Vice-Chairman James Tiffany.